2/9- After several devastating defeats at the hands of Dougherty’s rebel movement, the Monteddorian military scored a decisive victory this weekend in the skies above Salasan. After receiving reports that five of Dougherty’s captured Dragonfly fighter planes had been spotted in the area, the 2nd Monteddorian Air Squadron, nicknamed the “Flying Panthers” to denote their loyalty to Alejandro Julianos, took to the skies and destroyed the scouting party. Witnesses on the ground say the fight was brutal. The squadron is commanded by captain Anassia Degadas. A veteran of fifteen years, she was personally tasked by Julianos with putting the squadron together in response to Dougherty’s recent attacks. When asked about the supposed brutality of the fight, Degada says she wanted to send a message. Author’s note: Sorry for the recent irregularity of my posts, guys. I work in retail, and my hours have started getting crazy lately as the heavy release season starts, and are likely to get crazier the closer we get to the holidays. Also, every now and then I look at a headline I have coming up and find that I’ve already covered that particular topic or development in another post, and that leaves me scrambling to come up with something new. I try to plan ahead, and I still have about twenty headlines left in the hopper, so that makes things easier. I’m also working on revising a short story, so that cuts into my writing time as well. On top of that, I want to go back and revise the Gazette up to this point to clean up any errors that may have cropped up over the course of the last year and a half (there’s a bunch), and maybe release it as a compilation (either for free, or for a very low price…I’ll gladly consider any input from others who’ve done this before). But stay tuned! The road to Gazette #200 is sure to be a twisty-turny one, indeed! 7/8- Alejandro Julianos’ forces suffered another grievous blow this week, as the rebel leader Dougherty unleashed her recently captured fighter planes on Desantana Blackwood distribution operations across Monteddor. The attack happened in the early morning hours Vurnsday morning, as four five plane squadrons hit major distribution centers in Govanna, Desantana, Ballantine, and Salasan territories. In each case, the main Blackwood storage facilities were hit, sending fires raging throughout the centers and the surrounding countryside. Due to the unusual alchemical properties of the Blackwood, the fires have proven nearly impossible to extinguish. Analysts estimate that somewhere between one to two hundred tons of Blackwood were set alight in total. The costs from both the damage and the yield of lost Blackwood are said to be astronomical, and the death toll in said to number in the hundreds. Given the recent military alliance between Crowndon and Julianos, and the effects that this attack will have on Crowndon, many speculate that the Crowndon Air Corps may intervene. Neither Monteddor or Crowndon has issued a statement on this possibility, however. As for the rebel aircraft, all twenty planes managed to hit their targets and escape before Julianos’ forces could intervene, leading to questions about Julianos’ capabilities as the commander of Monteddor’s military forces. These concerns are only exacerbated by the fact that Julianos recently sent a large expeditionary force overseas to the colonies for unknown reasons. The attack has also led to fears that Dougherty may target the Blackwood Grove itself, which would be a disaster of apocalyptic proportions. As such, the Triumvirate Authority has tripled security around the Grove, both on the ground and in the skies above. 8/6- As if in answer to Alejandro Julianos’ promise to build new Blackwood refineries in Monteddor, groups of rebels flying the banner of Dougherty bombed three existing facilities within the borders of Julianos, Desantana, and Salasan Provinces. The attacks have brought Blackwood production in those areas to a stand-still, and claimed the lives of over 300 workers. General Rojos has taken to demanding the Dougherty rebels be labeled a clear and present danger to the interests of the Monteddorian Empire, if not the Triumvirate as a whole. A spokesperson for Julianos has called General Rojos remarks ‘inflammatory’, and stated that there is no need to declare all-out war on Dougherty and her forces just yet. 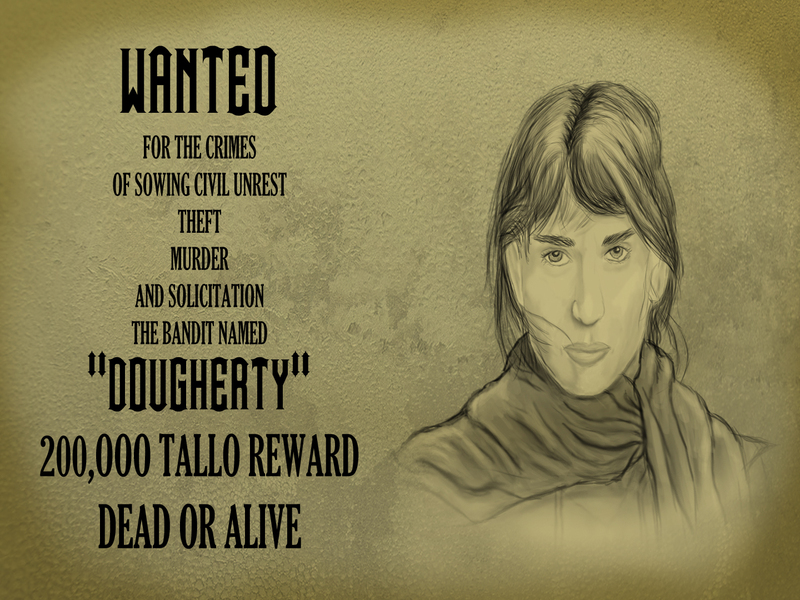 “It is very tempting to let loose and begin slaughtering anyone seen to be rebelling against Julianos’ authority,” the spokesperson said, “Julianos stresses that we must not forget that these rebels are Monteddorian citizens, and has even expressed a certain respect for Dougherty and her ability to rally so many under her cause in so short a time.